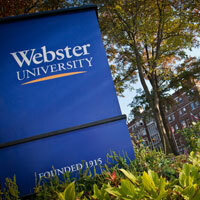 Webster University rose in the annual U.S. News & World Report rankings this year. ST. LOUIS – Webster University rose to 24th place on the annual U.S. News & World Report “Best Colleges” 2017 list, it was announced today. This is Webster’s highest ranking in three years. Besides the overall ranking, Webster University also was listed by U.S. News & World Report in several other categories, including Highest Proportion of Classes with Fewer than 20 Students, Most International Students, Economic Diversity, Highest Six-Year Grad Rate for Pell Students, Highest Six-Year Grad Rate (general), Campus Ethnic Diversity, Faculty Resources, A+ Schools for B Students, and Best Colleges for Veterans. This is the fourth consecutive year Webster has been listed in Best Colleges for Veterans. U.S. News & World Report named two of Webster University’s online programs among the best in the country in its 2016 Best Online Programs report earlier this year: online graduate business programs and the online MBA program were both ranked nationally. Webster University’s nurse anesthesia program also was mentioned earlier this year in the Best Graduate Schools rankings. Both the Online and Graduate Schools rankings are released separately from the overall college rankings.